Keyword research is one of the most important aspects that none of us should never neglect or overlook when it comes to doing local search engine optimization for their own business. 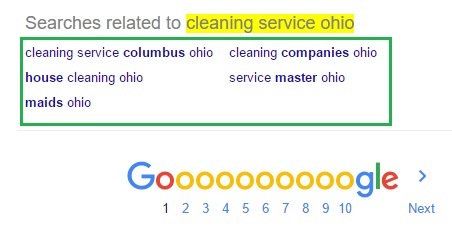 In the past, when two persons were to search for a particular keyword, let’s say, “housekeeping services”, (assuming one is in Ohio and another one in Texas) chances are the top ten results shown to them would be exactly the same. However, time has changed. With to the rise of smartphones users around the world, Google are seen encouraging more and more small business owners to gain more traction for their local search results. When the local search results improved, that means, you will have a better chance to increase your online visibility, as well as reaching out to a more targeted group of people. Hence, bringing in more sales to your local business. Which is why optimizing your website for local search gives you a better opportunity of coming up with a more personalized approach that can cater to your targeted audience needs and wants specifically. And once you can achieve that, Google will be more likely to increase your local search rankings. This can be seen from the recent Google search ranking algorithm that was rolled out in July 2014, called the Google Pigeon. This algorithm update is aimed to return mobile users with more useful, relevant and accurate results based on their distance and geographical location. So now, personalizing your local SEO results is the key that can bring you more success to your local business. But Why Is Local Keyword Research So Important For Your Local Business? 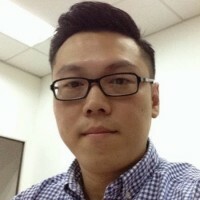 Some time ago, Google has predicted that mobile searches will soon surpass the desktop searchers someday. And recently, this has been finally confirmed by Google saying that the number of mobile searches has exceeded the number of desktop searches. This actually means that, for those smaller business owners who have been optimizing their business websites for local SEO would have better opportunity of targeting larger competitive broad search terms like “hostel”, “dentist”, “florist” “coffee” and etc. However, choosing the right local keyword that can bring in more quality traffic and sales for your business can be quite a challenge, if you do not know how to perform the local keyword research correctly. Unless your business is loaded with lots of funds which can allow you to test it out by running a few PPC campaigns simultaneously. And then based on the performance results to get the most lucrative keyword for your business. But then, if you target the wrong keyword, not only will you not be getting the business that you’re aiming for, but you will also tend to screw up every other marketing plans that you have been implemented. 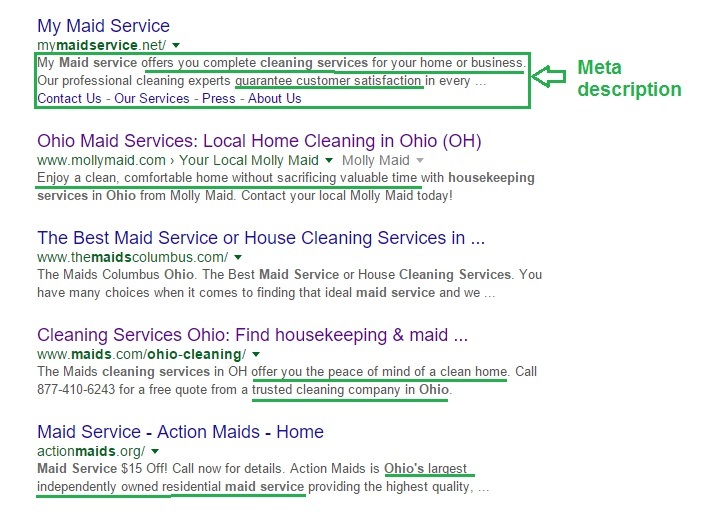 MAKE SURE: You find KEYWORD that can return a local results with the HIGHEST SEARCH VOLUME for your local business. Below are some of the awesome tools that you can help you to find the best LOCAL keyword for your business. Now, let’s look at some of the tips and tricks on how to perform a thorough local keyword research. Step 1: Identify your industry and location. In order for you to rank high in Google local search results, first of all bring your buyer persona into the picture, then think about what are some of the most common phrases or terms that people would use to look for when searching for your business. Write it all down in an Excel spreadsheet as you may want to refer, add, or delete in future. Step 2: Spy on your competitors. Well, spying on your competitors may sounds a little unethical to some, but that’s just how the way the business world works! So, below are some of the essential things that you might want to see how your competitors are doing. Analyze it and see how you can make it even better. Select some of the regular websites and then do a little research on it. Look for some of the regular websites and copy down their links. With all the gathered websites links from the above, head over to SEMRush, then do a little research on these competitors’ websites. Enter the website into the search bar and then click search. 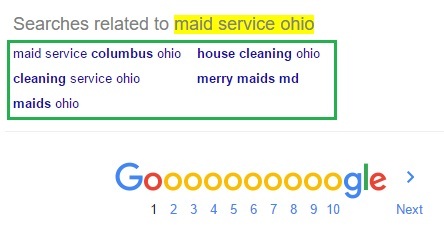 Once the results are out, then go to Organic Research tab and then click on the “Organic Positions.” The number shown is actually the organic positions and keywords that “The Maid” is ranking for on Google search results. You will be able to see the whole list of keywords together with the search volumes. Here you will be able to see quite a number of terms that “The Maids” is ranking for and by looking at the search volume, you will be able to know whether is it worth the time and effort for choosing a certain particular keyword from the list. Besides, you may also want to download it into an Excel spreadsheet or a CSV file for easy reference. Now, let’s proceed with another research on Elite Home Cleaners. 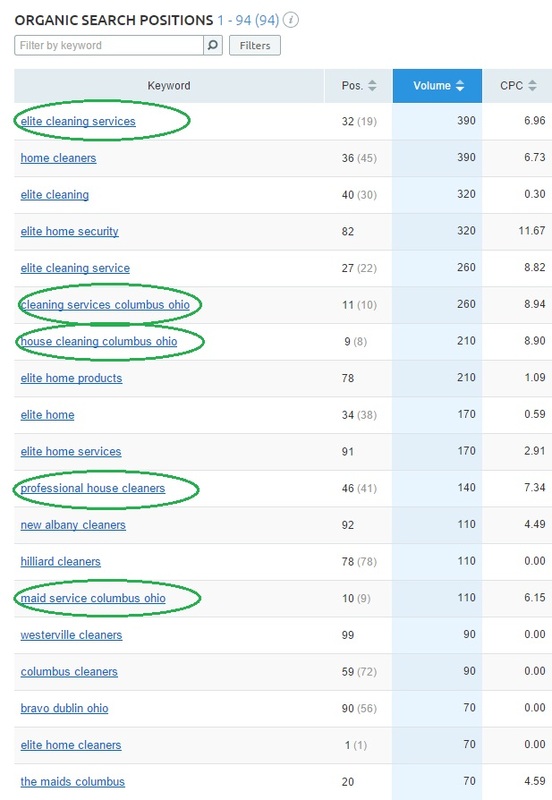 The results above show that “Elite Home Cleaners” is actually ranking for 94 keywords. Again, look into some of the variations of these keywords and then pick up those which you think have the highest potential that can bring you greater ROI for your business. It gives you some pretty good ideas of what kind of keywords you should be targeting for your business. 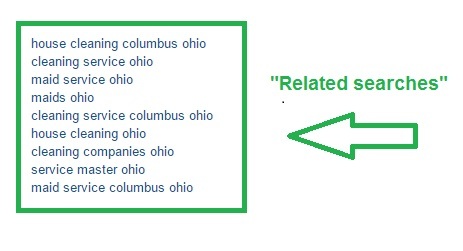 As you can see from the diagram above, these are some of the keywords that “Elite Home Cleaners” are ranking for and bear in mind that, since you are searching for a local keyword, it is also always best to add in the location in your keyword, and in this case “Columbus Ohio” is the most appropriate one. Now, repeat the steps for the other followings websites. Then later try to do a comparison between these five websites and then shortlist them. Anyway, this is NOT the only way of doing such local keyword research. However, if some of you have not sign up with SEMRush, then there is always another way to do so and that is by scrapping those keywords from Google suggested searches. Let’s see how I do it. 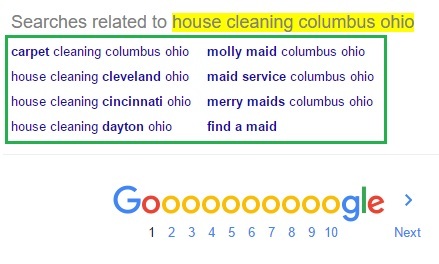 Step 1: First type in the search term “House Cleaning Ohio” into the search box and Google will suggest some popular search queries for you. 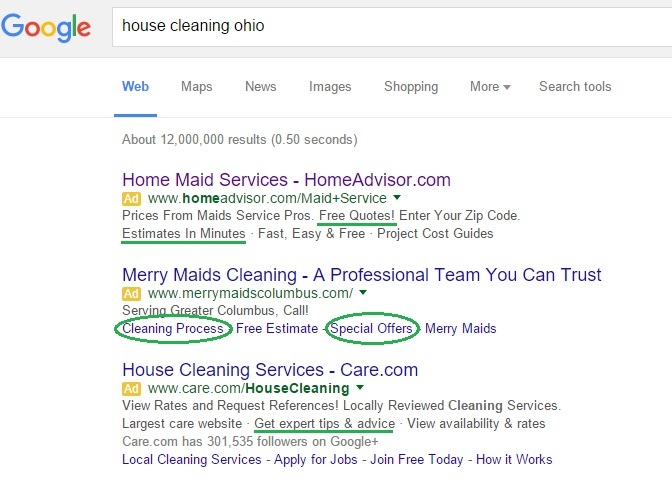 Type in your keyword and location and Google will propose some popular search queries. Then head down to the bottom of the result page and look at the suggested searches related to the keyword you typed in the search box earlier on. Step 2: Then perform a few more round of searching based on these four related searches. So if you have more than four, then you will just have to do all of it (usually there is only a maximum of 8 related searches) or just pick the one you like most. But I would suggest you do all. So whenever I see more unique suggested searches, I will continue to do a few more rounds. I’ll only stopped whenever I found out that if any of these related searches are starting to repeat on it own. Step 3: Then copy and paste all the related searches to Google Keyword Planner and get the search volume data for all these keywords. 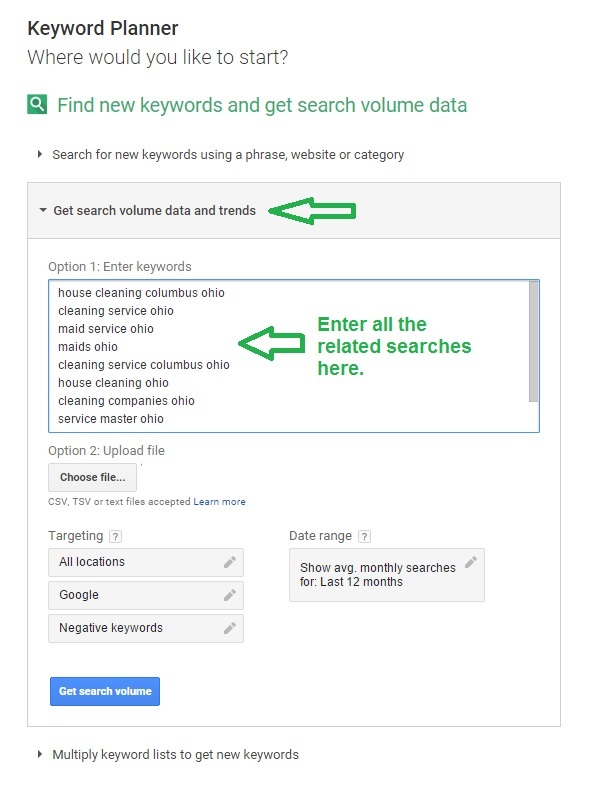 Use Google Adwords Keyword Planner to get the search volume data for all the keywords. Titles: The very first thing that users will notice when searching for your product or services. Meta descriptions: In order to get higher click-through rate, make sure you put higher emphasis on writing a great meta description that can convince users to click on your websites. That can be done by looking at some of these top ranking websites’ meta descriptions. See what keyword they use and see how they write it. Look into some of the top ten rich snippets and see how they write their meta descriptions. 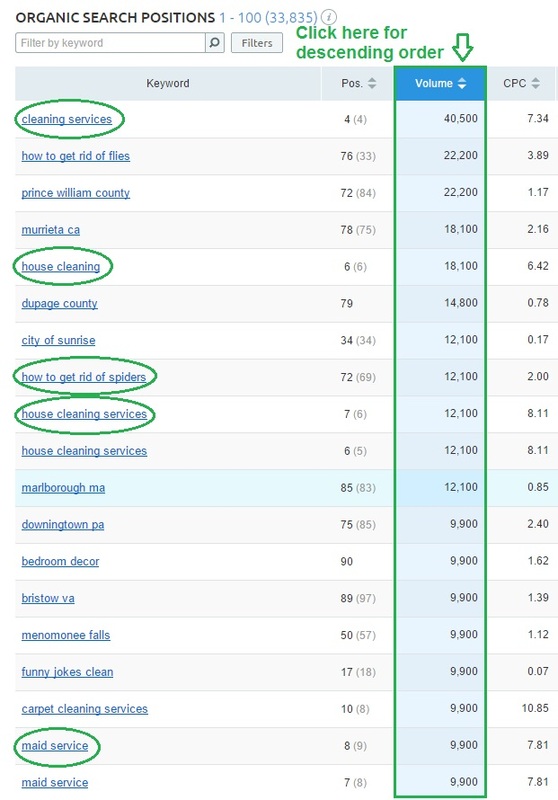 Check your competitor’s blog and see what kind of keyword they are targeting! Besides, you may also want to check on the PPC ads that’s available on the first page of Google. 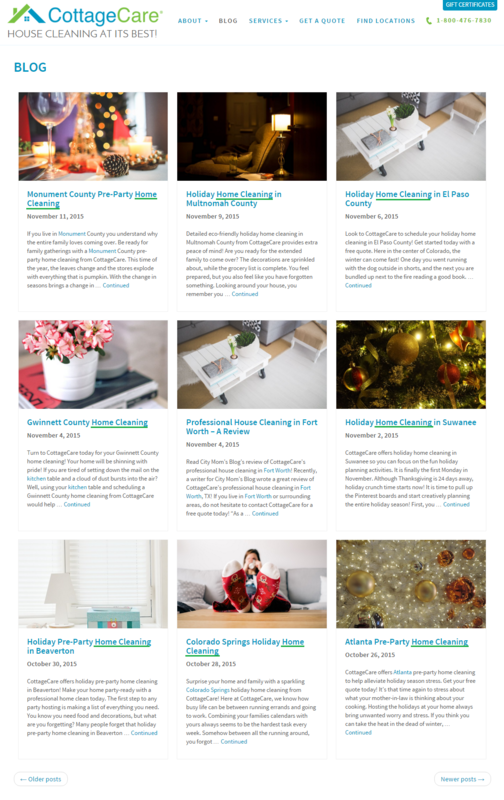 See how these companies optimized their snippets. These companies have probably spent thousand of marketing dollars to optimize their ads messages in order to get higher quality traffic and the best return on investment from the PPC advertisings. Tip: So it is always advisable to look into some of these ads. And then carefully scrutinized on some of the words they used in the ads and think about why such words are being chosen. That is because you may want to use some of those words as an idea to optimize your meta description later. 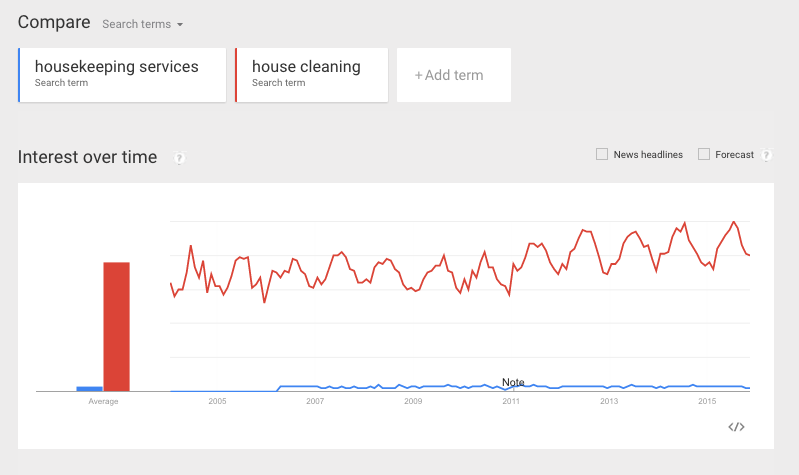 This feature allows you to know which keywords terms perform better over past decade. By looking at the interest over time, you will have a better notion on which keyword actually performs better over the past decade. This feature shows the search volume for different location on the map. It is always good to know this as it will also give you a pretty good idea on how to develop a better marketing strategy to target different region if you wish to expand your products or services in multiple locations. 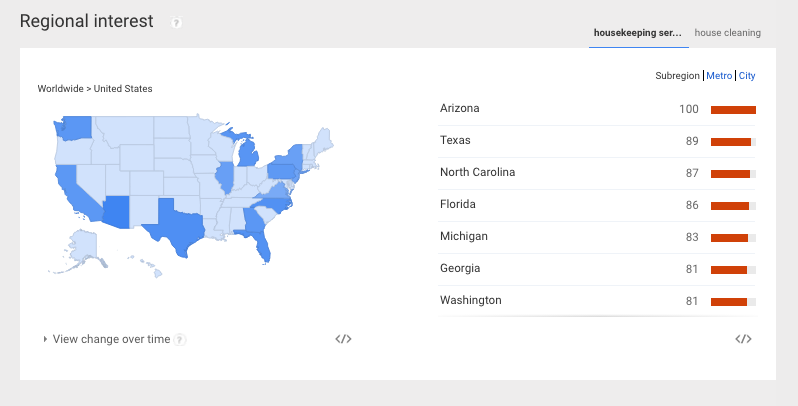 This feature shows the popular top queries within the geographical area. Now that you know there is no one fixed way when it comes to finding the best local keywords for your business. Anyway it is always recommended if you can combine some of the above methods in order to find the most suitable keywords and that’s related to your industry. No matter what, leveraging on some of these tips will definitely give you a better opportunity in uncovering more and more potential and profitable keyword for your local business. So, give it a try and feel free to let me know if you have any other better ways to do local keyword research in the comment section. That’s all for now.